Long before naming rights for buildings and facilities were a thing, Homewood-Flossmoor High School dedicated spaces in the South Building to two special people. For years, every major performance, presentation and awards ceremony has been in the Mall Auditorium named for Calvin Mall, a student who died in 1963. 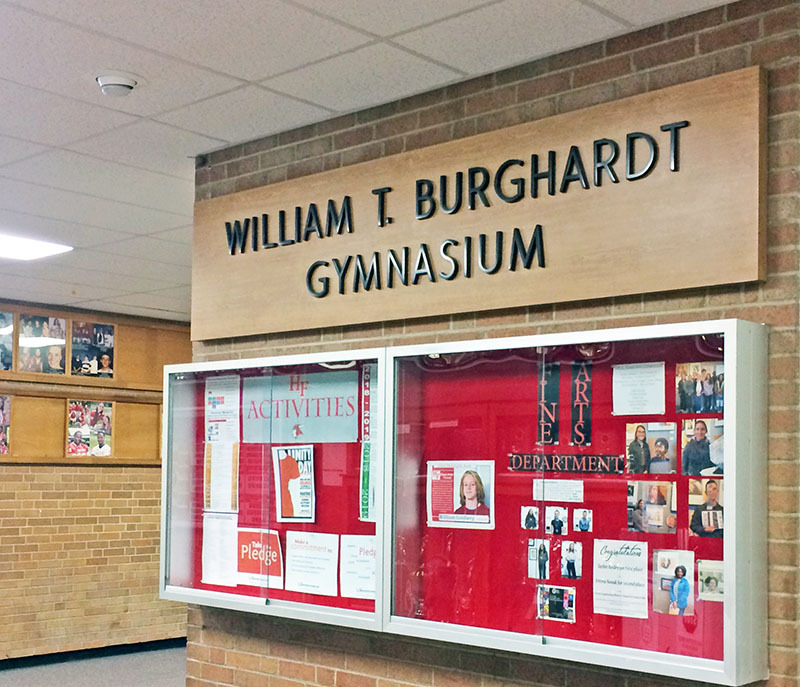 The District 233 school board honored William T. Burghardt, the first athletic director at H-F, by naming the gym in his honor. The surprise announcement was made at a farewell party for Burghardt when he retired in 1982 after 23 years at H-F. In 1957, the community petitioned for the creation of Homewood-Flossmoor High School. After two years of planning, the school opened in 1959. Burghardt was working at Rich East High School when he agreed to take H-F’s athletic director/basketball coach job. “It was a case of taking 45 coaches from all parts of the country and saying: ‘This is the philosophy of the school’ and make it work. At H-F, it was going to be quality from Day One,” Burghardt is quoted in a Star Newspaper story. Students selected the red and white colors for H-F, but Burghardt told a student reporter for H-F’s Voyager newspaper that it was he who designed the red warm-up pants with the white stripe down the side the players wear. 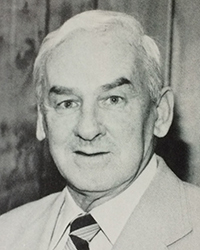 Over his long career at H-F, Burghardt was a coach and coordinator for the physical education department and athletics programs before moving into the administration, serving as assistant superintendent and acting superintendent. 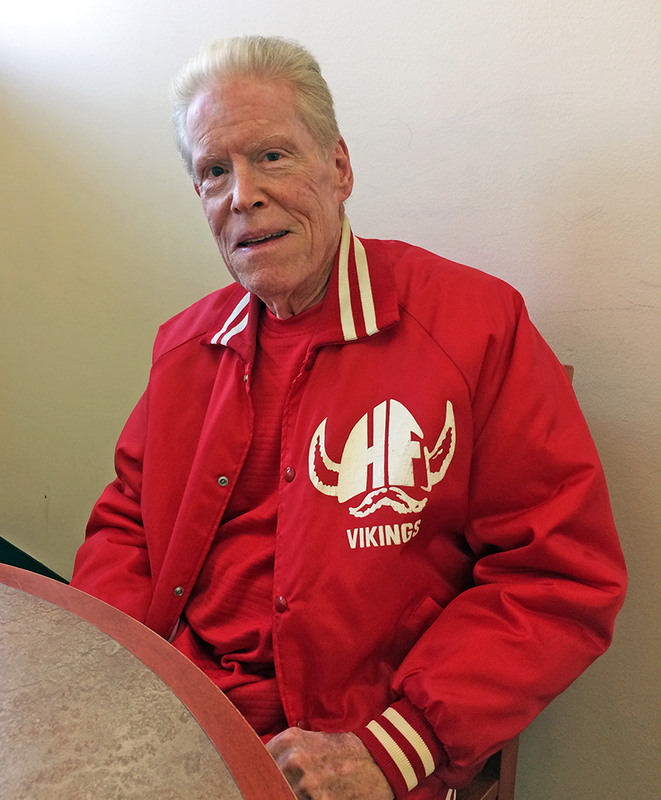 Burghardt’s daughter, Ginni Burghardt of Homewood, said her dad always loved his job at H-F. She recently met David Platt of Park Forest, a 1963 graduate of H-F who befriended her dad in his later years. When Burghardt died in March 1997, his wife, Jayne, called Platt to the house. She presented him with Burghardt’s H-F jacket, which Platt still wears today. 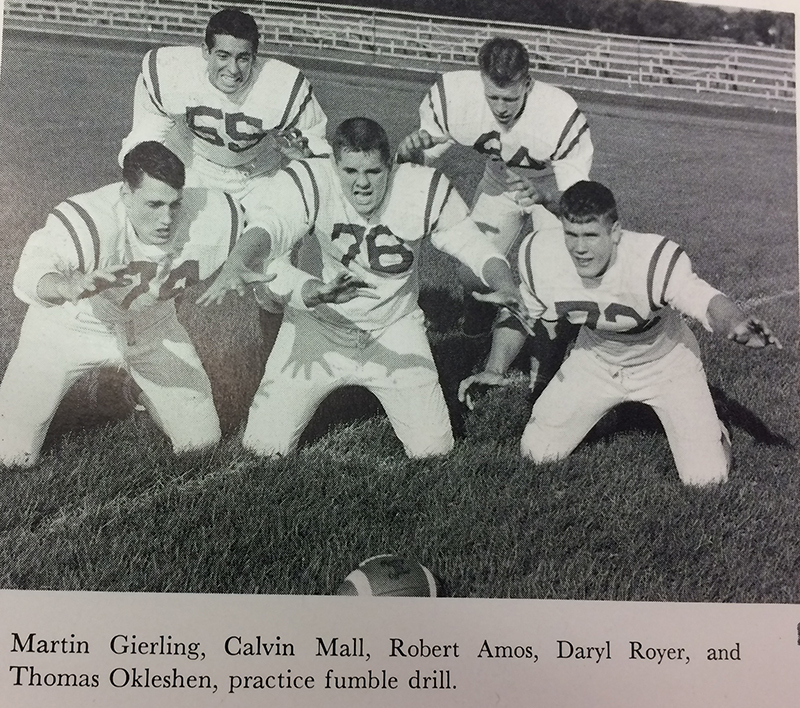 Calvin Mall was a senior in the Class of 1963 when he was killed in a car accident during the winter of 1963. 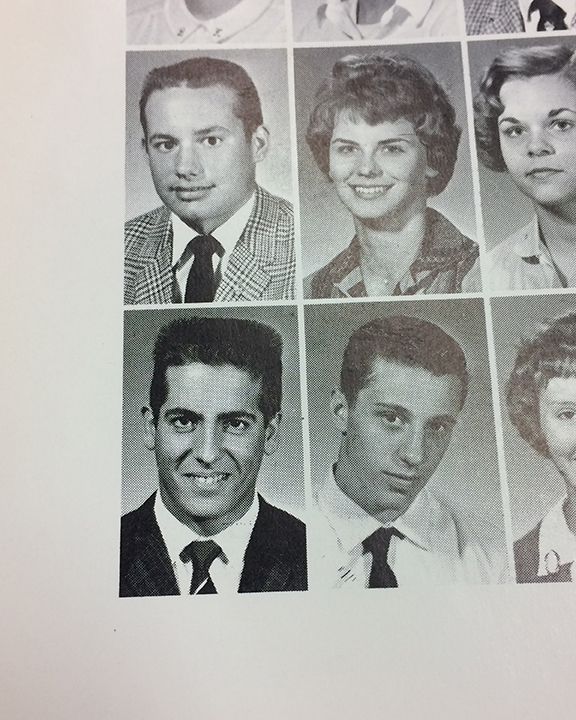 The H-F yearbook shows Calvin photographed with the football team. He ran track for a spring sport. Calvin was the son of Florence and Arthur Mall. The family lived in Flossmoor. His father, Arthur Mall, was the founder of Mall Tool Company. At one time, the Mall Tool Company factory in Chicago employed 2,000 people. Arthur Mall sold the business in 1956 to Remington Arms Corp. and was running a small manufacturing firm in Crete when he died in 1959. Calvin Mall’s surviving sibling, Diane, lives in California. Following Calvin’s death, a building at the football field was dedicated to him. The original building near the football stadium burned down. The replacement brick building still carries the Mall name. It is used as locker rooms, athletic training rooms and a concession stand during fall and spring sports seasons. Florence Mall made a donation in Arhtur and Calvin’s name shortly after his death. At the time, plans for the high school auditorium were under consideration. The District 233 board designated the monetary gift to help cover a portion of the costs for the auditorium and dedicated it to Arthur and Calvin Mall, according to Ann Cherry, director of alumni relations at H-F. The most recent renovations to the 744-seat auditorium were done in 2006. 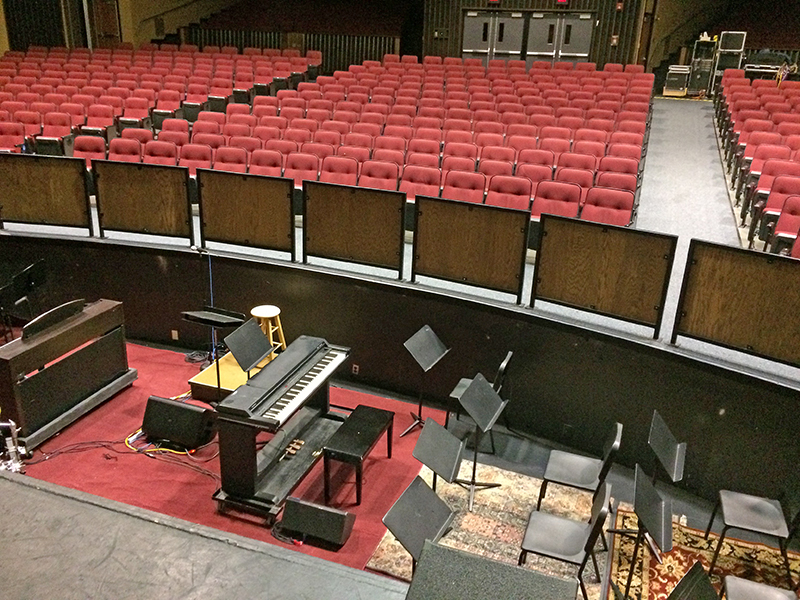 Tom Wagner, operations manager, said the stage, sound panels and rigging were redone and the auditorium got new seats and carpeting through a fundraising effort. It was then that the first names were dropped, and the space became known as the Mall Auditorium. Wagner said the H-F stage is considered big for a high school, especially once the pit is raised up to extend the stage all the way out. 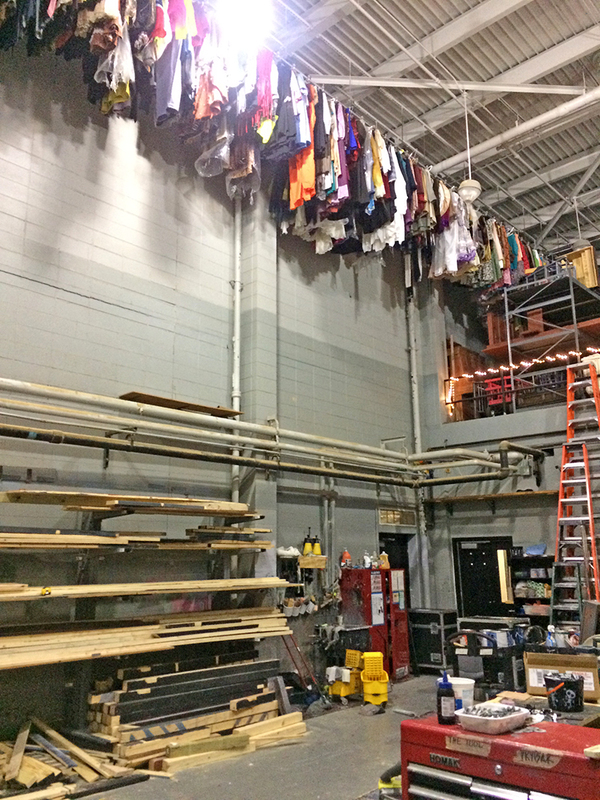 Behind the stage is a small area for costume storage and scenery construction. The proposal for a Fine Arts Center will add a black box theater onto the auditorium. The multi-purpose space will be used for rehearsals and some productions and give students more space, storage, set design and costume changes.